Yarn Geek Heaven: Demystifying T Shirt Yarn Series: What the Heck Do People Make With It? 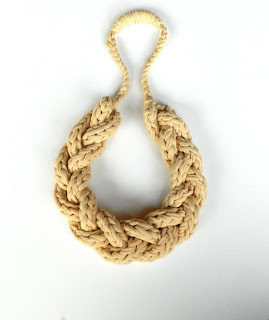 Demystifying T Shirt Yarn Series: What the Heck Do People Make With It? Last month we discussed what t shirt yarn is, how to properly use it, and what to look for in quality. So what do people make from it? Well, this month let's look at some of the teamUpcyclers shops and see what they are doing with it. Rose from Sew Ecological likes to knit with it. 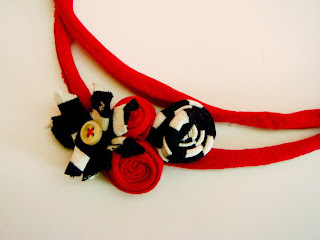 Rose also makes many things from upcycled sweaters, as well as working with handspun yarn. I really enjoyed browsing her shop and admiring her work. She has a cowl up in her shop that is a wonderful example of how you can knit and crochet with t shirt yarn to create one of a kind items. 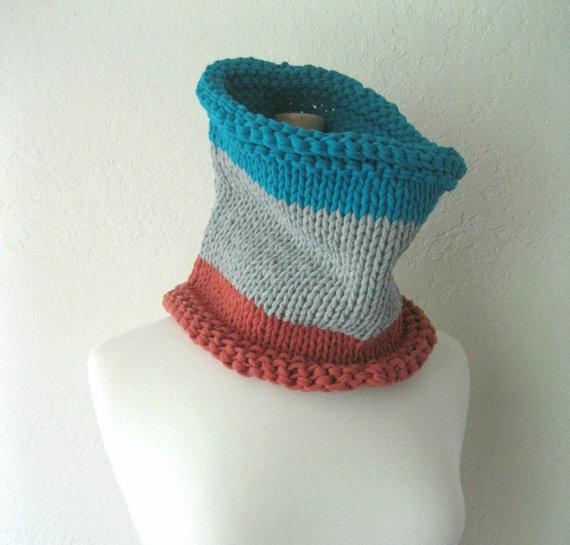 This pretty cowl is available for purchase here. Mike from Mike's T Shirt Yarn has many lovely items made from t shirt yarn in his shop. Of course, Mike also makes fabulous t shirt yarn so he has a wonderful inventory to work with. 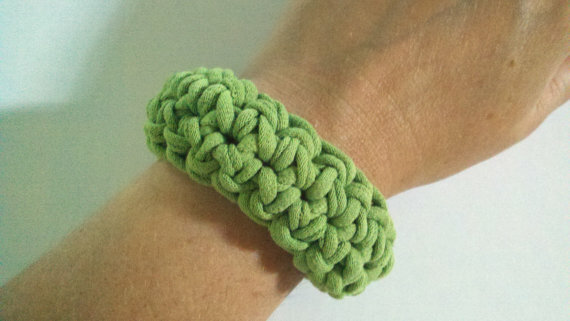 You can find knotted bracelets and some fun crochet pieces in his shop, as well as t shirt yarn. I personally know that Mike has a strong commitment to eco friendly products and supplies and am grateful for the support and encouragement he has always given me. I would recommend his shop to anyone. Here are just a few examples from his shop. 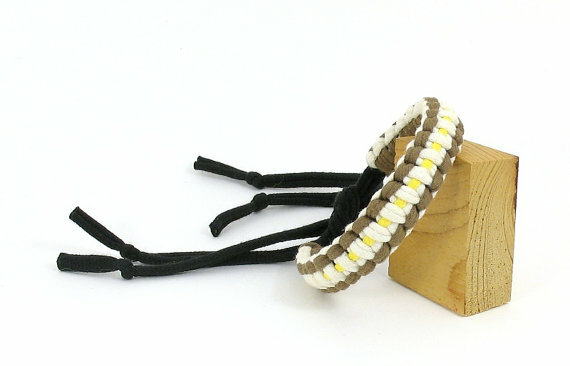 This stylish and earthy bracelet is available for purchase here. This bright and cheerful pencil (or crochet hook) holder is available for purchase here. This soft statement necklace is available for purchase here. 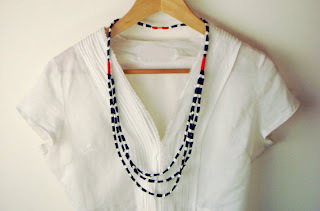 This beautifully braided necklace is available for purchase here. 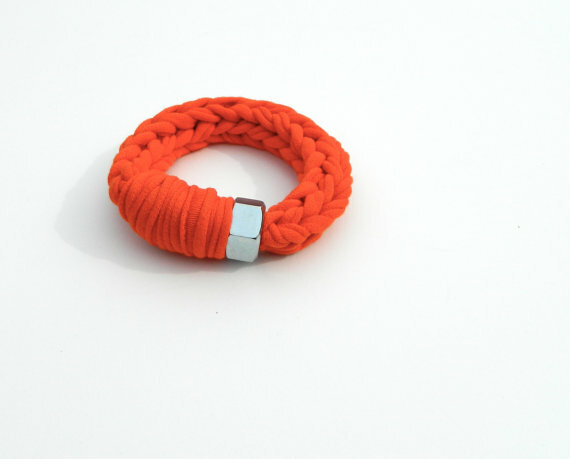 The fashionable bracelet is available for purchase here. 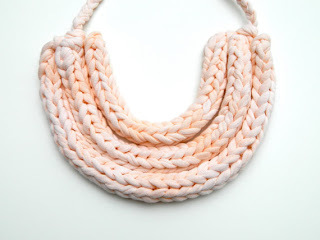 Kristy from Scratch Made has a delightful shop full of bright and pretty jewelry made from t shirt yarn. She displays a variety of styles and colors that are sure to please the eye. She only submitted one listing to me so that is all I will use, but you won't be disappointed by visiting her shop. Personally, I think this bracelet is all you will need to want to see what else her shop has to offer. This fabulous bracelet is available for purchase here. Susana From Recosas tells us on her shop greeting that "'Recosas" are things which have been given a second chance". Beautiful, isn't it? She also told us that the spanish word for t shirt yarn is trapiño and it is used to make a kind of carpet called jarapa. I really must learn to speak spanish because it uses the most lovely words. Susana makes a lovely array of upcycled items and I encourage you to browse her shop. What you see below is just a sample of what Susana has to offer. This lovely necklace is available for purchase here. This stunning necklace is available for purchase here. These pretty hairpins are available for purchase here. Last, but certainly not least, is Rain from Remaine Wicked. Rain has a large selection of items for children and some adult items, like fabric cuff bracelets, cell phone cases, and beautiful bags. There are also many soft baby blocks, upcycled clothes, and educational quiet/busy books. 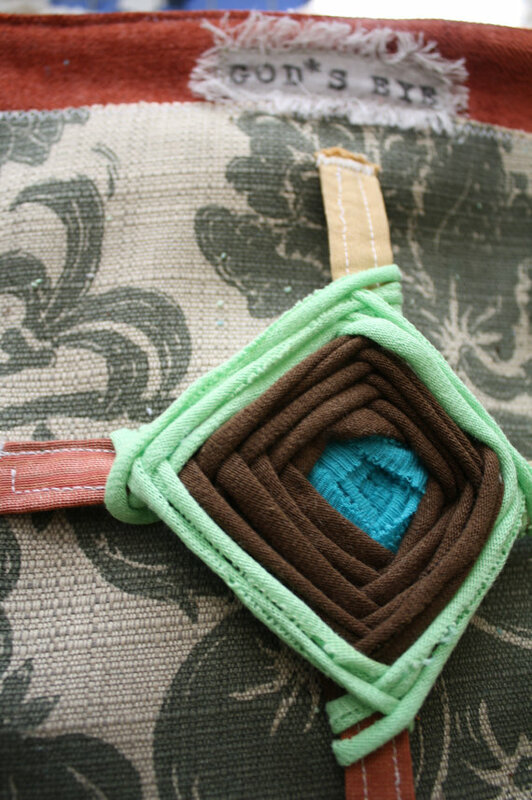 I would encourage anyone to look through her shop, especially if you have small children. She uses t shirt yarn in her quiet books for the braiding and God's Eye pages. Below are a couple of examples of her quiet books. You can see the t shirt yarn on the braiding on this book, which is available for purchase here. You can see the t shirt yarn in the God's Eye in this book, which is available for purchase here. As you can see, there are many uses for t shirt yarn. 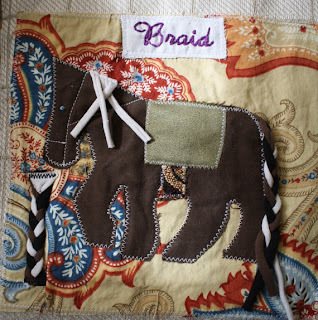 Other popular uses are pot holders, rugs, coasters, and trivets. I also know of people who use it in their gardens to tie plants. Weaving with it is also popular. I have seen many people use it in making baskets with great success. The possibilites only end with your imagination. What would you do with a ball of t shirt yarn? Were would your imagination carry you? 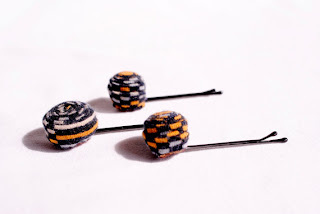 I hope you will get a ball and find out because next month I will give you some tutorials on things to make with t shirt yarn. I'll have some knitting and crochet projects, as well as braiding and weaving. There will be something for everyone, from beginners to more advanced projects. The perfect way to end the series. So be sure to catch the next and last article in this series on August 20. A Shop Feature that Features Me!!! A Blog Feature about Me!! !